Bath Body Lotion and Soap: Deep Conditioning woes? On the hunt for a fabulous body lotion? Quick story..my sister comes home a few months ago raving about a new body lotion she has found. 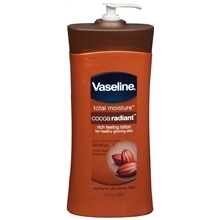 She pulls out a massive bottle of Vaseline's Cocoa Butter Deep Conditioning and insists that I try some. Well, I stole her bottle and continue to do so every chance that I get. It is a great, extremely affordable, long lasting lotion. It does exactly what it says: deep conditions your skin. And to add to its benefits, you don't smell half bad either.